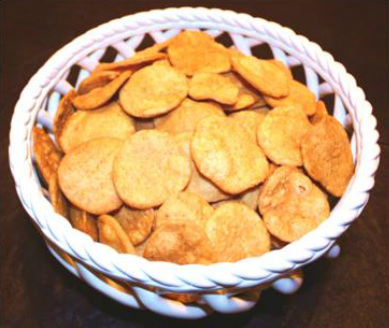 Mathri is a traditional classic North Indian afternoon tea time snack. It is made with maida (all-purpose flour) and sooji (cream of wheat), to make mathri crispy and flaky oil is added to the dough and ajawain (carom seeds) is added to it to give the flavor. After making the dough it is rolled into small circles and deep fried. Mathri is great on its own with tea but traditionally they are served with Mango or lemon pickle along with tea. It really goes well with aloo muttar ki sabzi and Aloo gobhi sabzi or chutney. Mathris are usually served at weddings and poojas and made in almost every household on special occasions and festivals or entertaining guests. Mathri is also a great snack to carry while travelling as it is dry and can be stored for weeks in an air tight container. Mathris are the perfect snack for anywhere, anytime. 1. In a bowl place all purpose flour and cream of wheat, and mix them together. 2. Add carom seeds, salt, and and mix with flour. is incorporated well and flour mix becomes crumbly. the bowl, knead it for few minutes. small flat ball. Make few balls and keep them aside. 5. Repeat the process until you make all the mathris. medium heat for 6 to 7 minutes or until oil become hot. becomes too dark quickly it means oil is too hot, turn the heat down. the top of the Mathri’s. become golden brown on both sides. the process until all the Mathris are fried. 7. Store Mathr's in an air tight container. 8. Serve Mathri's with pickle of your choice. 1. To save time, fry mathris at the same time you are rolling them. cookies.Take a bigger portion of the dough and roll it into a large circle. cut the large circle into small circles. run the food processor for few second to mix all the ingredients together. While food processor is running add little water at a time and make the dough. and cover it with damp towel and let it rest for 15 minutes.